Heel to Toe Walk: Position the heel of one foot directly in front of the toes of the other foot, so closely that they’re touching or close to touching. While concentrating on a spot ahead of you, lift the back foot up and place in the same position in front of the toes of the other foot. Repeat for 20 steps. Balancing Walk: Holding arms straight out to the sides and concentrating on a location in front of you for balance, take steps forward in a straight line, stopping to lift the back leg and hold for a second. Repeat for 20 steps. Standing Leg Lifts: Standing and grasping a sturdy chair for balance, slightly bend one knee and lift the leg behind you. Do not lean forward or back, point your toes, or bend your knee any further. Hold for a second and repeat 10-15 times before switching to the other leg. Side Leg Lifts: As with the standing leg lifts above, stand and hold a sturdy chair, but this time, slightly bend one leg and lift to the side. Hold for a second, lower the leg, and repeat 10-15 times and then switch to the other leg. 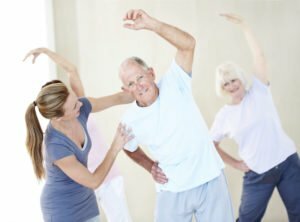 For more balance and strengthening exercises, or for hands-on help in keeping your senior loved one safe at home, call Hired Hands Homecare’s Petaluma, CA office at 707-575-4700 or contact us online. We’ll start with a free in-home safety assessment, analyzing the senior’s home and proposing simple solutions for maximizing safety, decreasing fall risk, and making the home as comfortable as possible. We’ll then develop a personalized plan, particular to your loved one’s individual needs and desires, to provide the highest quality Petaluma home care services to improve his or her quality of life and wellbeing and overall senior health. To see our full service area visit this page. We look forward to serving you!